News is something most of us can not live without. Whether it is the local, national or international news we crave it (really want it). However, not all news, as we well know, is good news and often we receive bad news. So here are some ways for talking about the news in English. 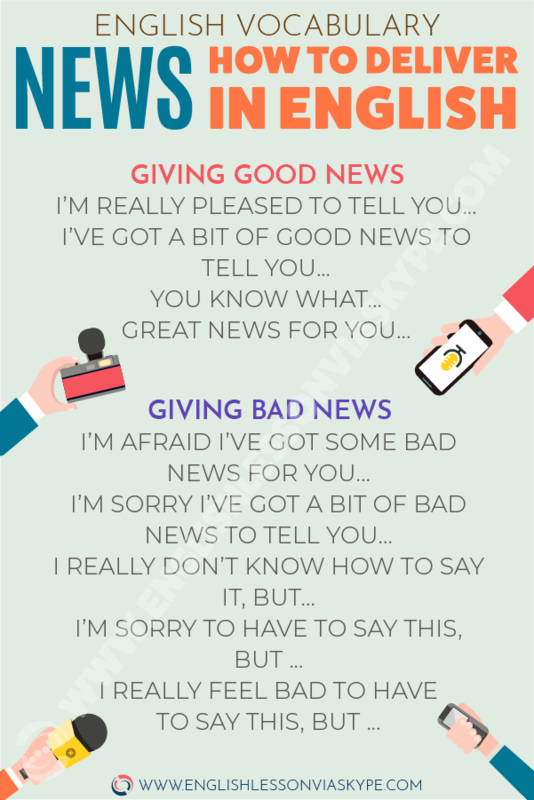 These expressions will help you in English conversation when you either have to deliver (give) good and bad news or receive it. There are many different ways to give news in English whether it is good or bad. Some people are better than others at delivering bad news and normally most people do not have a problem giving good news. you have been awarded a bonus by the management in recognition of your achievements this year. we are going to have a baby! Isn’t that wonderful. I am so excited. depending how big the news is you can use a number of adjectives and their superlative form to pass on (give) your good news. you know that old car in the garage that we have been trying to sell for months? Well someone at last has seen the advert came around earlier today and offered us the price we were asking!! you are in the team for the next match.You played well last week and you deserve your place. you are not being considered for the vacancy in the accounts department. I am really sorry but another candidate with more experience has been offered the job. I’M SORRY I’VE GOT A BIT OF BAD NEWS TO TELL YOU.. I am sorry I don’t think we can be together anymore. I have met someone else and I think our relationship has gone as far as it could go..
your work is just not good enough. You work hard but there Are too many mistakes and we constantly have to correct it. We feel it would be better for you and us if you moved on and found another job. its either me or the cat! The cat does not like me and I am constantly cleaning hair off my clothes. It is old and smells and I am not comfortable with the way it looks at me. I know you have had it a long time but.. When do you move? What are you going to do with your apartment and car? Have you told your parents yet? I’ll book the hotel now and the flights and we can look on line to see what we can do when we get there. 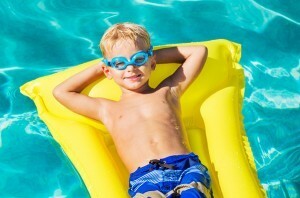 It will be great to have a break. Wow, a baby. After all this time. I cannot wait to tell my friends. WHAT FANTASTIC / GOOD / BRILLIANT / GREAT / WONDERFUL / SPLENDID NEWS! I am sure you are thrilled. When did you hear? How did you react when you heard? THAT’S GOOD / BRILLIANT / GREAT / WONDERFUL / SPLENDID NEWS! you must be over the moon. It’s a great opportunity for you and your family. It could not have happened to a nicer person. Well deserved. We must go out and have a few beers to celebrate. You are buying! I needed some good news to start the week. Let’s hope this continues for the rest of the year! All of these single word responses can be used in any good news situation no matter what the occasion is. it had to be you that had to tell me. I know it cannot be easy. What happened exactly? When are you leaving? Where will you go? Will you write to me and keep in touch? It must be very upsetting for you. Is there anything I can do to help? If you need anything all you need to do is ask and I will be happy to help if I can. I was not expecting that. Don’t you think you are over reacting a little? It’s only a cat! you must me devastated. But you know you will get another job quickly. You are too good at what you do. It’s not easy to hear bad news like that but you seem to be taking it as well as could be expected under the circumstances. Losing a parent is never easy even at such a great age. At least it was pain free in the end. I lost my father a few years ago and I still think of him a lot. How did it happen? Did they break in when you were asleep or when you were out. My god at least you were not injured. That’s too bad and we were looking forward to meeting up with you. Never mind we can re arrange it when you are feeling better. We would all have enjoyed meeting you. But look we are going to meet up more regularly now and so there will be another chance to catch up next month. 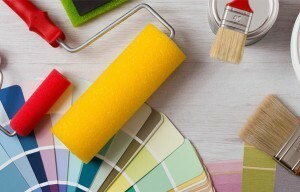 But if there is not too much damage perhaps it won’t cost so much and the insurance will pay for most of the repairs. How to talk about CHANGE in English? How to use Phrasal Verbs with COME?